The holidays are over, so now is a good time to detox. What better way to do that than with your besties? I recommend throwing a Holiday Detox Brunch! 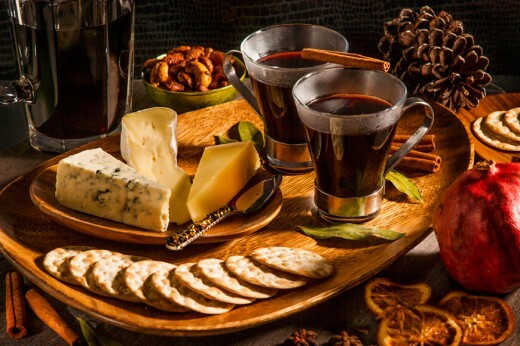 It will mitigate those “holidays are over” blues and will make your detox a lot more fun! Since I am featuring a recipe for Orange Yogurt Pancakes, I went with a citrus theme for the brunch. If you don’t go with a citrus theme, make sure to choose something that will go well with your healthy vibe. 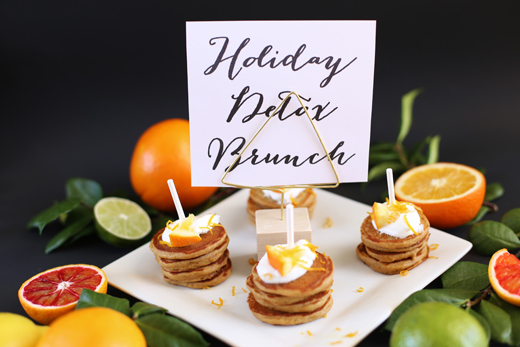 Start with this free printable “Holiday Detox Brunch” sign for your guests. Display it in a place card holder or photo frame. You can even hang it on your front door. For refreshments I served juices. I poured a mix of grapefruit, orange, and green to go along with the citrus theme. Another great idea would be to serve smoothies like this Cranberry Pomegranate Smoothie. I displayed the juices on various sized wooden blocks that you can get at your local crafts store with fruit and greens from my backyard as garnish. Next up, I served dark chocolate dipped oranges sprinkled with sea salt. This is an easy appetizer that looks gorgeous. Plus it’s healthy! These could also be doled out for dessert. My recipe for Orange Yogurt Pancakes is perfect for a detox brunch. This healthier version of my favorite breakfast food is made with yogurt and whole-wheat flour instead of oil, milk, and white flour. Although they are lighter, you won’t miss out on flavor. These things are delicious. To make them, first melt the butter. Then in a bowl, combine the melted butter, sugar, yogurt, egg whites, and orange juice. 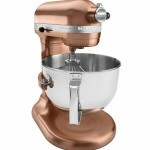 In your KitchenAid® Professional 620 6-Quart Stand Mixer sift together the flour, baking soda, baking powder, and salt. Add the yogurt mixture. Using your Stand Mixer, stir the batter until it’s combined well. Spoon out the batter onto a heated and greased griddle. Heat the griddle at medium heat. Cook the batter until bubbles form, and then flip. Cook the other side until golden. Instead of serving pancakes like you normally would, for a party it’s fun to do pancake skewers. To make them, stack the mini pancakes and secure them with a popsicle stick, toothpick, or skewer. To serve, garnish the pancakes with yogurt, mini orange slices, and orange zest. They can be dished out plain, with honey, or with pure maple syrup. 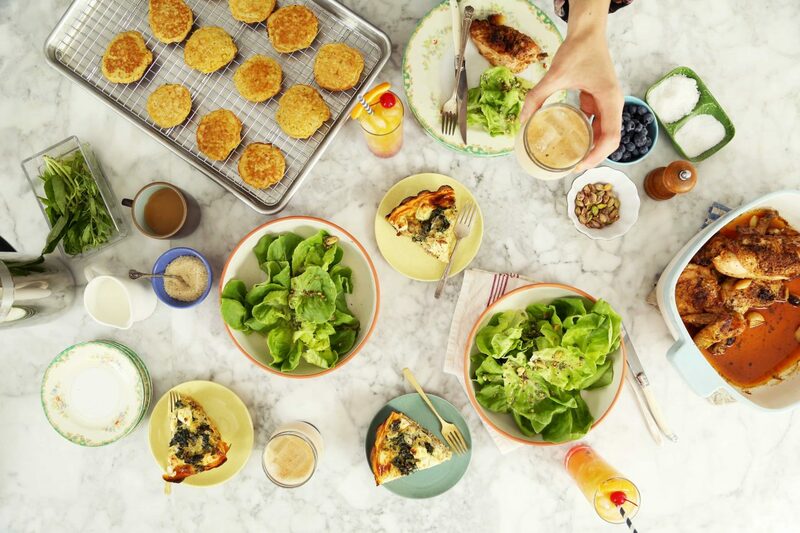 A few simple steps, and you can host a gorgeous and fun Holiday Detox Brunch! Melt the butter. In a bowl, combine the melted butter, sugar, yogurt, egg whites, and orange juice. 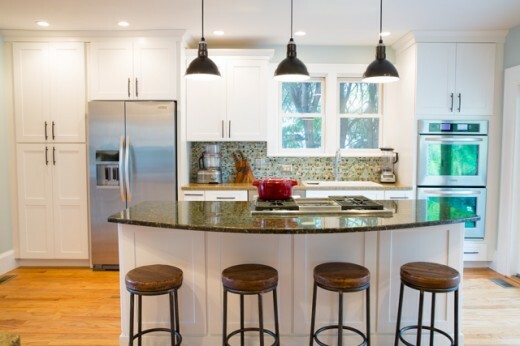 In your KitchenAid® Professional 620 6-Quart Stand Mixer sift together the flour, baking soda, baking powder, and salt. Add the yogurt mixture and stir with your stand mixer until it’s combined well. Spoon out the batter into small circles onto a greased griddle. Cook the pancakes at medium heat until bubbles form, and then flip the pancakes. Cook the other side until golden. To serve, stack the pancakes and secure them with a popsicle stick, toothpick, or skewer. Garnish your pancakes with a dollop of yogurt, mini orange slices, and orange zest. Serve your pancakes plain, with honey, or with pure maple syrup.